How many of us are list makers? List upon list upon list. And THEN, we have a sticky note to amend the list, adding things as we see fit! And what about the people doing things not on their list but adding them only so they have the satisfaction of crossing them off. WHAT IS THIS ALL ABOUT? There are many tips and tricks and systems out there for managing these out of control never-ending records of things we feel we must do. Many of you even know what to do—but my question is WHY DON’T YOU DO IT? Not finishing our list causes so many feelings—our day is never done. 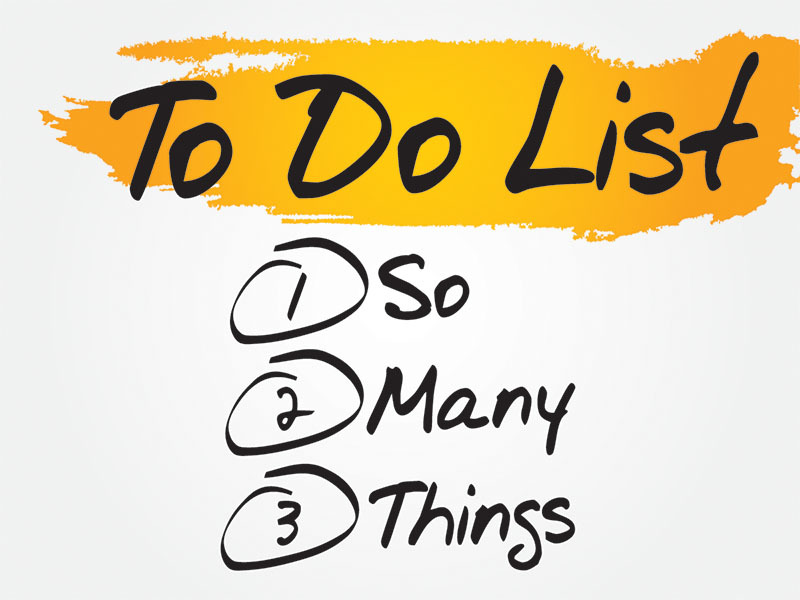 We’re so busy trying to check off as much as possible that the truly important things get pushed back because they “take too much time.” We go back to work after the kids are asleep because we need to GET THROUGH THE LIST! And still, we aren’t done. And at the end of the week, we feel like we were so busy but we really don’t know what we did OR, we have guilt around all the things still on the list that just keep getting pushed to the next day and the next, and the next . . . SO, I have a tiny solution that is NOT rocket science or even really that original. But, if you can take 5 minutes at the start of your day and apply my 3 D’s System, you will start making progress. I promise. The 3 D’s System—DO. DELEGATE. DUMP. When you look at that list, ask yourself to categorize it into three areas: DO It. DELEGATE it. DUMP it. Do IT: These are the things that ONLY YOU CAN DO. And I mean only you! For instance, Only I can network for my business. Only I can make my sales calls. Only I can run my UNSTUCK program. Only I can write my content. Only I can make my training modules. And there you go! Literally NO ONE else can do these things! These are where you start –move the needle forward! DELEGATE IT: A little tricky because we feel it’ll take too much time to teach someone to do what needs to be done, or that no one can do the task as well as we can. Huh. Really? If you teach someone ONCE, they can take that task off your hands forever! Does the CRM input need to be done exactly how you would do it? Are you the ONLY one who can go to the grocery store? This step requires you to get down and dirty with your list and ask if there is ANY ONE else that can do these things! You can pay them, or there might be minions running around your house who could do them for free! DUMP IT: The scariest “D” of all! DUMP? Like take it off the list? YES! DUMP IT. It might mean that you dump it to a specific date 3 months from now and put it on the CALENDAR to be done. It might mean to let it go—is it something that will move the needle forward on your business? Is it essential? What is the harm in taking it off the list? These are your test questions! My rule of thumb is this: If something is on your list 3 days running, you must DO IT. DELEGATE IT. Or DUMP IT. Get these things off your list! As I said earlier, this isn’t rocket science. It’s truly something I’m sure you’ve heard in some way shape or form before. But I challenge you to think each morning of the 3 D’s and get that list conquered! The only way to change what you do is to change what you do. Go forth and conquer my friends!! Enjoying my BLOG? Be sure to like me on FB at /juliemillerdavis15 and follow me on twitter @julie_jmd. And if you haven’t already, sign up for some sizzling stuff and be the first in the know by signing up for my updates using the purple form in my footer below.